This is a first for us, here's a picture of a fish nipping at the feet of a baby duck. 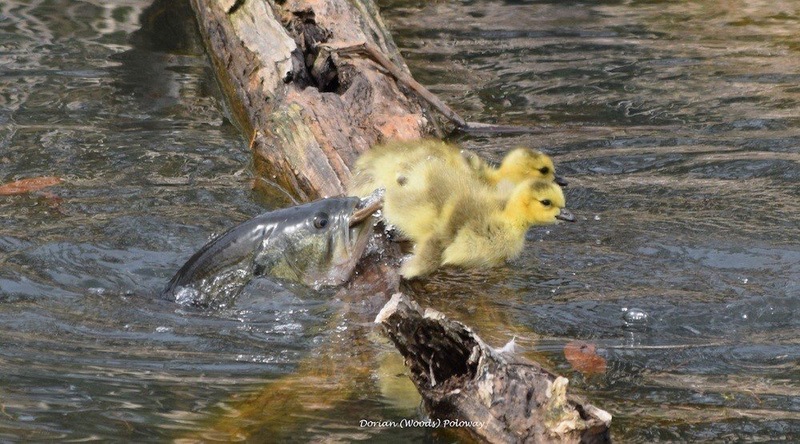 We'd heard of eels catching ducklings before but never a fish. We think the fish may be a bass? It's certainly large enough to be able to feast on the cute fluffy thing! If we caught that fish ourselves, what could we cook in on? We could have a nice BBQ, using a propane burner, get it really hot, add some butter, maybe some pepper. That would be a pretty sweet meal. Maybe have some baby duck with it?